The Evil Dead trilogy is one of my all-time favorites, and I feel that the Evil Dead series really started up the horror movies that don't take themselves too serious. Evil Dead one is an absolute classic, it's the film that started it all and it's still highly enjoyable every time I watch it. Final verdict: 5/5 Rent or buy? : A must buy for any Low-Budget horror fan. IF YOU FIND THIS REVIEW HELPFUL PLEASE REMEMBER TO VOTE. Thank you. I had this version before. Glad it was affordable. 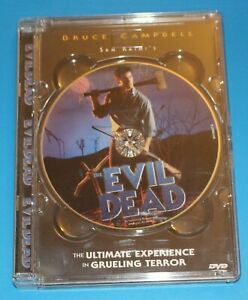 Movie review courtesy of Deathgrind.com: Evil Dead : Sam Raimi : 1982 : 5/5 : Cheesy gorefest! A classic! A group of teenagers spend a weekend at a house in the woods, but being the dumbasses that they are, they read the Book Of The Dead, causing all Hell to break loose.